Ilios Noche at Rea Village offers a Private Dining Room seating up to 48 guests. The full restaurant can be reserved for up to 120 people. The private space is secured by a minimum food and beverage spend which varies based on date and time of day. Minimum food and beverage spends do not include 8.25% tax and 20% gratuity. We can accomodate Buffet Dinners, Plated Dinners, and Appetizer Spreads. Groups of 15 plus are required to use a set menu. A credit card will be held in case of cancellation within 72 hours of the event. Cancellation fee is 50% of the minimum food and beverage spend. 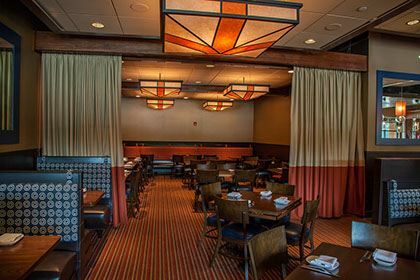 Restaurant will issue an Event Agreement, once that Agreement is returned signed and we have recieved credit card information, the reservation will be secured. We hosted a party there for 2 people, one was 4, the other was >29. We were 12 in number, and it was enjoyed by all. Service was fantastic. Special Features: A/V equipment available at no charge.